Perhaps it was a sense of estrangement from the everyday that drew Cynthia Sorrel to the village of Cooper Patent. The failed painter was lured by the gatehouse with its seven doors, the lake with its tower, and the magical air of a place that couldn't quite decide whether it was fictional, mythic, or real. The gatehouse should have been a first clue that she was on a journey, and soon she begins to glimpse and then to pursue a figure in the woods near her house, convinced she has seen the Muse. As she reclaims her calling as a painter and moves deeper into the uncanny world of Cooper Patent, Cynthia finds herself at the heart of a labyrinth of mystery. She will have to navigate its dream depths and secrets, brilliant or dark, locked behind a door that opens into the earth. Sébastien Doubinsky writes, "I cannot recommend an author more than Marly Youmans, whose fantastic prose is absolutely gorgeous and haunting." Now this "best-kept secret among contemporary American writers" (Books & Culture) has scaled the tree of books and plucked twigs of gothic romance, ghost tale, medieval dream vision, and belated coming-of-age story, with a leaf or two from the novel of manners and fantasy. The transformed result, Glimmerglass, is a gift to literature like no other. I know of no writer other than Marly Youmans who has the genius to combine the spine-tingling suspense of Gothic storytelling with the immense charm, grace, glamour, realism, and simplicity of Hawthorne. Youmans, one of the biggest secrets of contemporary American fiction, writes with freshness and beauty. Her ability to describe a person, a place, or the psychological underpinnings of a plot or individual, ranks with the great novelists, the highest literature. A tale of love and intrigue, mystery and pathology, Glimmerglass’s appeal is the warmth and charge of a tale told round a fire fused by Hitchcockian anxiety, empathy, and relief. Nature, architecture, dread, thrill, sexual dilemma, and murder echo against Youmans’s gorgeous prose and terrifying romance, which glides like a serpent—without a single extraneous or boring word. Youmans is my favorite storyteller. I come back to her as if to a holy well. 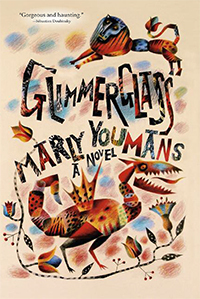 You might not even know what you are seeking, but once inside the pages of Glimmerglass, you’ll find exactly what you need: ‘a cup of music, a hill of sea.’ In the Republic of Letters, Marly Youmans is our Magician in Chief.